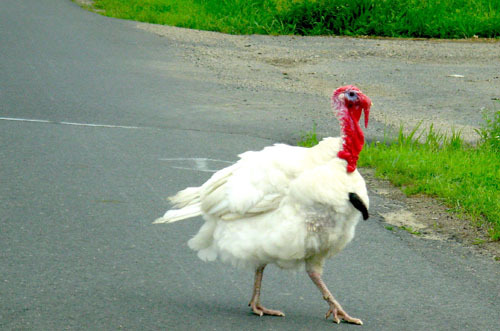 Turkey on the Road by flicker user tomswift46. I've blabbed before about my Google Reader and Google Alert addictions. As my day job has ramped up I don't have time to cull through the dozens of articles constantly being sent my way by these services- and I'm always afraid a terrific story might fall through the cracks. So what does that mean? Time for me to slog through the backlog, pick out the best news, and put it all together for...the Art Advocado pre-Thanksgiving Art Ed Links Roundup! Read on to find out about art on the back of your car, Magritte meets the iPad, a 24-hour draw-a-thon, art education in Egypt, and one lucky teacher who hit the jackpot for her art room. Art ed advocacy, Egypt-style: from Almasry Alyoum, an interesting perspective on art education in Egypt. The piece speaks to several art teachers in Egypt as well as a social psychologist who emphasizes how art can boost confidence and help children express themselves. Bearden, Tennessee high school student may get some major visibility for her artwork, in her state and beyond. Sixteen year old Sarah Byrd entered a competition to design Tennessee's "Support the Arts" license plate, and her design has made it to the top ten. The other nine finalists are all professional artists at least a decade her senior. If Byrd wins, she'll have her art teacher to thank (at least in part) - she entered the competition for an assignment in her art class. You can vote for Sarah's design at stateyourplate.org through November 23. Meet Canada's Art Teacher of the Year, as deemed by the Canadian Society for Education through Art: Bonny Hill of Sussex, New Brunswick. The secret to success in her 25-year career as an art teacher? Hard work ("I'm barely at home") and allowing students to explore the media of their choice - whether it's painting or computer graphics. She's humble, too. "These things are so random...I can think of lots of people I should be nominating who are amazing teachers." Congratulations Bonny! Lucky! Florida art teacher Jill Hallauer hit the jackpot, bigtime. Her art room will undergo a $25,000 makeover from HGTV design program Home by Novogratz. Hallauer and her principal, Judy Cosh, admit they are extremely lucky, but hope the end result will inspire other teachers to make creative changes to their own classroom. Students are psyched too. Nine-year-old Josefa Torres said she's glad her art room is getting the makeover because "It's the most best thing in the whole world." Spoken like a budding arts advocate! Photoshop is a coveted skill in today's competitive job market, one that many adults would love to add to their resumes. Meanwhile, some lucky fourth graders in New York state are getting a jumpstart on the program while learning some art history too. S.J. Preston Elementary Art Teacher Melissa Sgrulletta's class created their own takes on Munch's The Scream. Looks like fun - and not a bad skill to have in your back pocket either. In Middletown, NY some lucky art teachers are excited to be getting iPads for their classes. A grant-funded project is providing the high-tech tablets to the entire school district. The Times Herald-Record reports that the art teachers can't get enough of these "unlimited sketchbooks." One art teacher said she looks forward to using the iPad as a way to supplement traditional art - not replace it. Along those lines, here's a great example of iPads in the art room: via @fuglefun on Twitter, a digital take-off on Magritte's Son of Man. On a programming note there won't be a new Art Advocado post next week. I'll be giving thanks for my readers and for the art educators and advocates everywhere. And, of course, for mashed potatoes. Thanks for reading and see you in December!